Do you think he actually believes this drivel or is it just something he has to do to sell his soul to Trudeau? Nice countries with high living standards are expensive to live in. Show me one first world country where its citizens don't think the taxes are too high. He must have been the first guy in line buying weed when it became legal. Not Bob likes this post. Better start having kids again so I can afford to live here. It's election year, and look what party he's in. The Koolaid is strong with this one. Jlabute wrote: Better start having kids again so I can afford to live here. This guy is a clown and represents no one in the Okanagan. Ashamed he got voted in! lol sounds good to me... and if my wife doesn’t put out, just get more wives. My eyes kind of glazed over when I started reading this drivel. I guess if you repeat something often enough it must be true. “looking after the middles class “ October can’t come soon enough!! By the numbers: 92% of Canadian families face a $2,200 increase in payroll taxes in 2019. Fuhr is full of *bleep*. Worst MP ever! Of course, MP Fuhr is correct, and our bumbling, ever-confused friends on the looney-right are once again wrong. Big surprise. Let us remember the so-called conservative solution to every problem is to give the richest folks huge tax cuts, and saddle everyone else with the debt. The last two so-called conservative governments added $500 billion to the accumulated debt. That's 75% of the total since confederation. Given Canada is at the top of the quality of life charts, intelligent people would say our taxes are quite reasonable. Our cowed friends on the right say something else. crookedmember wrote: Of course, MP Fuhr is correct, and our bumbling, ever-confused friends on the looney-right are once again wrong. Big surprise. Well you have the trudope deflection mantra downpact. Making peoplekind woke one platitude at a time lol. The good thing is you will end up broke just like the rest of us. 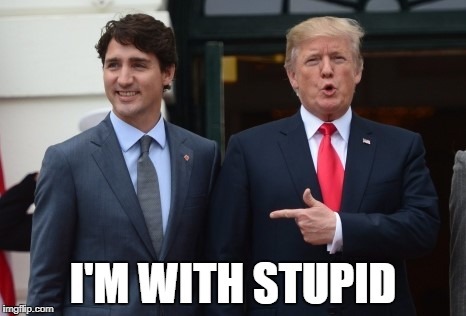 Canadians have proven insanity for the last several decades, voting in the same crooked parties time after time thinking that anything will change. A hot stove is a hot stove people, even a 5 year old knows this. So you’re voting NDP this election?